1. Preheat the oven to 200°C, gas mark 6 and line a baking tray with parchment paper. Blanch the asparagus spears in boiling water for 1 minute, then cool in iced water. 2. Cut each sheet of filo pastry into 6 equal strips widthways and brush with some of the melted butter. 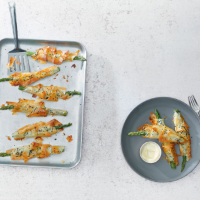 Place the asparagus diagonally on top and scatter with a little of the cheese. Roll loosely leaving the asparagus tips showing. Brush with more butter, place on the baking tray, scatter with the sesame seeds then bake in the preheated oven for 10-12 minutes until golden and cooked through. Serve with mayonnaise.